Saint Sava Storozhevsky of Zvenigorod left the world in his early youth, and received the monastic tonsure from Saint Sergius of Radonezh, whose disciple and fellow-ascetic he was. When Great Prince Demetrius of the Don built the monastery of the Dormition of the Mother of God at the River Dubenka, in gratitude for the victory over Mamai, Sava became its Igumen, with the blessing of Saint Sergius. Preserving the simple manner of his ascetic lifestyle, he ate plants, wore coarse clothing and slept on the ground. In 1392 the brethren of the Sergiev Lavra, with the departure of its Igumen Nikon into the wilderness, asked Saint Sava to be the igumen of the monastery. Here he “shepherded well the flock entrusted to him to the best of his ability, helped by the prayers of his spiritual Father, Saint Sergius.” According to Tradition, the great well outside the Lavra walls was built when he was igumen. Saint Sava accepted the request of Prince Yuri Dimitrievich, and praying with tears before an icon of the Mother of God, he entreated Her protection for the wilderness place. On Storozhi Hill, he built a small wooden church of the Nativity of the Most Holy Theotokos, and a small cell for himself nearby. Here in the year 1399 the monk established a monastery, lovingly accepting all who came seeking a life of silence and seclusion. Saint Sava toiled much at the building up of his monastery. He dug a well at the foot of the hill, from which he carried water on his own shoulders; he encircled the monastery with a wooden palisade, and in a hollow above it, he dug out a cell where he could dwell in solitude. 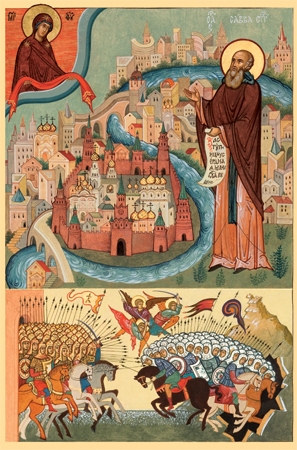 In 1399 Saint Sava blessed his spiritual son, Prince Yuri, to go on a military campaign, and he predicted victory over the enemy. Through the prayers of the holy Elder, the forces of the prince won a speedy victory. Through the efforts of Saint Sava, a stone church of the Nativity of the Most Holy Theotokos was also built to replace the wooden one. Saint Sava died at an advanced age on December 3, 1406. He appointed his disciple, also named Sava, to succeed him. Veneration of the God-pleaser by the local people began immediately after his death. The miraculous curative power issuing from the grave of the monk, and his numerous appearances, convinced everyone that Igumen Sava “is truly an unsetting sun of divine light, illumining all with its miraculous rays.” In a letter of 1539 Saint Sava is called a wonderworker. Tsar Alexis Mikhailovich had a special veneration for him, repeatedly going to the monastery of Saint Sava on foot. Tradition has preserved for us a remarkable account of how Saint Sava once saved him from a ferocious bear. Now Dionysius had not known the saint personally, so he summoned Elder Habakkuk, who had known Saint Sava in his youth, hoping to convince himself of the truth of the dream. He described the outward appearance of the saint, and Habakkuk assured him that the saint looked exactly as the igumen had seen him in his dream. Then Dionysius fulfilled the command and painted the icon of Saint Sava. The feastday of Saint Sava was established at the Moscow Council of 1547. The incorrupt relics of the saint were uncovered on January 19, 1652. You revealed the desert as good growth, O Venerable One. / For from your youth you desired to live a pure life, / Following your spiritual director and his teaching, / You trained your mind on the heavens, / You have shown the wisdom of the instructor to your flock. / Therefore, even as Christ has shown you the torch of the enriching wonders: / Our Father Sava, pray to save our souls. Burning with desire for the Lord, / You shook off carnal passions. / You were revealed as shining with the never-setting Divine Light. / Rays of wonders poured from your relics upon all the faithful, / O our Venerable Father Sava.